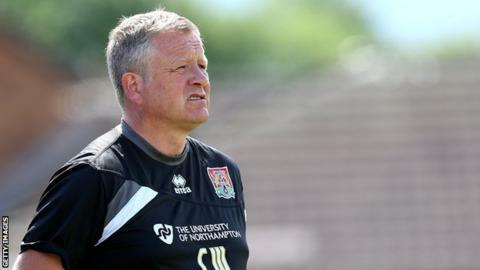 Northampton manager Chris Wilder wants his players to have a "competitive attitude" ahead of the new season. The Cobblers have just finished a training camp in Sussex, where they played pre-season matches against Worthing and Burgess Hill Town, securing a 5-2 win and 0-0 draw. "Players will be disappointed with Saturday's result. We played okay," Wilder told BBC Radio Northampton. "We created a lot of chances but that's the competitive attitude I want." Wilder continued: "I want them to do well in everything we do, in anything we do in training or in matches - we want to win." "There were a lot of good signs going forward and the new players we have signed integrated themselves with the existing members of the squad very well." Northampton, who finished 12 in League Two last season, now have two more pre-season matches against Championship sides - Derby County on Saturday and Birmingham City on Tuesday.